Of all the outrageous warning signs and postings I have seen, this one is one of the best! This was a sign taped in the courthouse in White Plains, New York, Westchester Supreme Court. 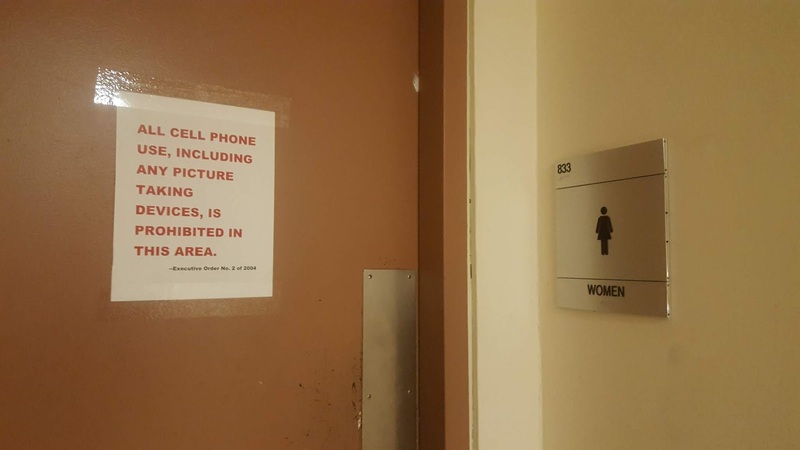 This sign warns you not to take a selfie in the bathroom. 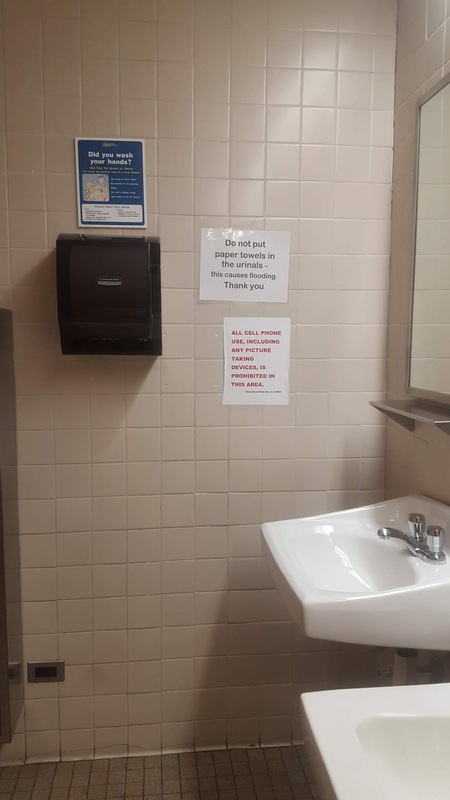 There is a sign outside the door and one inside near the sink, in case you thought you might ignore the first sign as you walked in. And in case you were wondering if this was an actual law, conspicuously placed at the bottom of this notice is the number of the executive order and the year it went into effect. The signs says: All cell phone use, including taking pictures, is prohibited in this area. - Executive order #2 of 2014. So what was I to do? I snapped a picture of course! 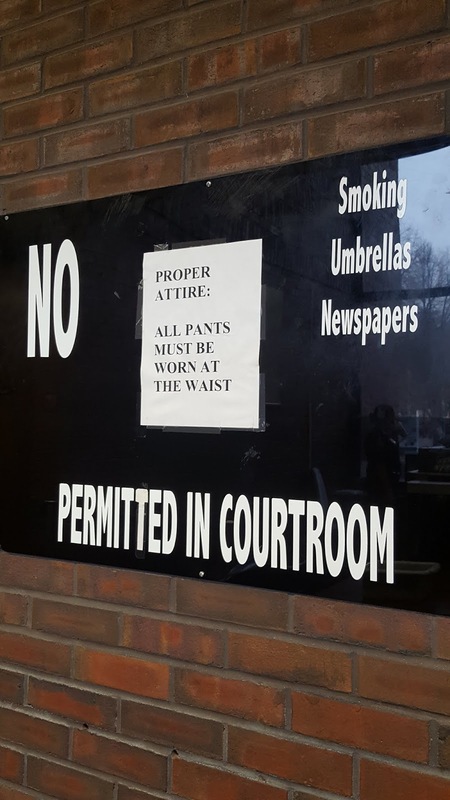 It's a sad state of affairs when a sign is needed to remind people that you need to dress appropriately when at the courthouse and that appropriately means: pants worn at the waist! This is at the courthouse in Peekskill, New York. The posted sign states: Proper attire: All pants must be worn at the waist. Where is the decorum? the proper etiquette? ... the self-respect?! They should give out summonses! The joke goes that so many things you learn in school you will never use in real life. The funny thing about this is in actuality, at times, you do use those lessons in real life without even realizing it. Problem 1: A person 100 meters from the base of a tree, observes that the angle between the ground and the top of the tree is 18 degrees. Estimate the height h of the tree to the nearest tenth of a meter. There are so many lessons in high school that you would think you will never need again. Law school is no different. How many times in law school did I learn a doctrine that I truly felt I will never use nor see ever again? One day I was reading a book for my local book club, The Alienist by Caleb Carr. 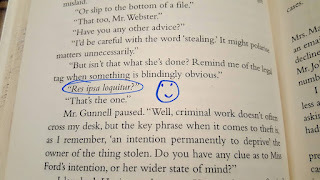 First published in 1994, it was a major phenomenon, spending six months on the New York Times bestseller list, receiving critical acclaim, and selling millions of copies. A "touchstone of historical suspense fiction", a period piece that is "fast-paced and riveting, infused with historical detail". Sounded interesting enough! It is the last place I would think to find an esoteric legal doctrine I learned in my first year of law school, in Torts class no less. First of all, even the word "torts" is not one that is ever used outside the halcyon days of first year of law school. Instead one says "personal injury case". 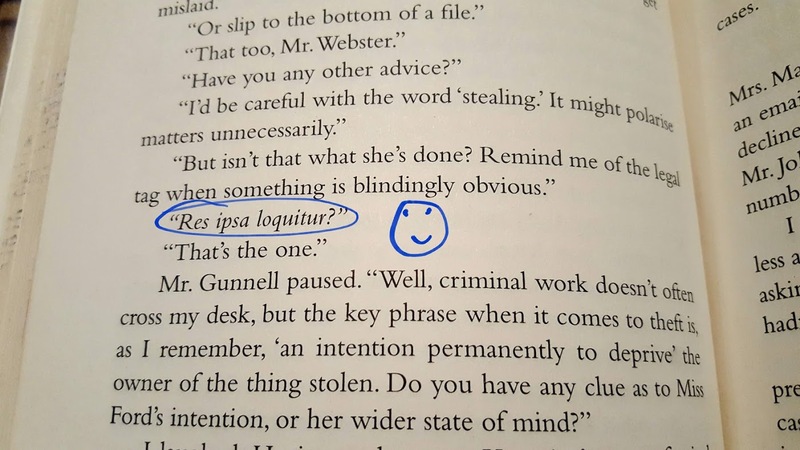 So to see res ipsa loquitor a decade later was a precipitous journey way back to sitting in the back of Torts class at Howard University. So for all 1L students struggling through your classes. It may seem unforeseeable but don't worry because one of these days those seemingly expendable legal dogmas will creep up on you when you least expect it! It started with fast food workers demanding higher wages. Now all workers across the nation have galvanized to win a $15 an hour minimum wage. In 2012, 200 fast food workers walked off the job to demand $15 hourly wages and union rights. What began as a fast food workers plight has become a global movement! Thanks to Fightfor15.org, now more than one in five workers is covered by $15 minimum wage. Twenty-two million workers have won $68 million in raises. The federal minimum wage is set at $7.25 an hour and has remained the same since 2009. According to the Associated Press, twenty states have minimum wage increases taking effect in 2019. Twenty-Nine states and the District of Columbia have set minimum wages above the federal level since 2009. It is great to see that workers are getting an increase in their minimum hourly wage. But when you think about it, nowadays everything is tracked and pinpointed. Your location can be pinpointed and be off by just a few yards, if even that. Time also can be tracked by the millisecond, or even less than that. What then, if you work an extra 2 minutes at work? Shouldn’t you get paid for those extra two minutes? California courts say yes! California Supreme Court departs from the doctrine of federal wage-and-hour de minimus doctrine that excuses the payment of wages for very small amounts of time that are irregular and administratively difficult for the employees to track. But nowadays time need not be difficult to track at all. 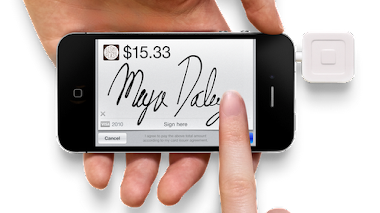 According to the California Supreme Court, if the time can be captured, then it can and must be paid. This means that if you stay at work for an extra 2 minutes, then you must be paid for those extra two minutes! There is one unexpected, small, minor, shall I say, minute problem with this ruling. This pay-by-the-minute ruling suggests that now your time at work cannot be rounded up. Rounding up of time is common and it is permissible under federal law. But if we are tracking by the minute, essentially tracking by the second, then rounding up seems to be de minimis. Rounding up of your time at work becomes negligible and unnecessary. Think about it, for a minute or two and you will see that it makes sense. 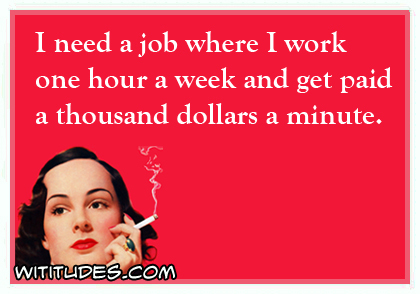 Or on second thought, if you live in California, use those extra few minutes instead and get back to work…. 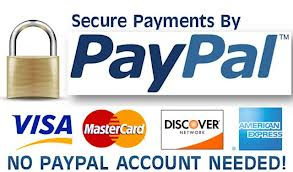 Because you get paid by the minute! Attorney Advertising. Travel theme. Theme images by sandoclr. Powered by Blogger.